Two House Democrats called upon the Department of Justice’s Acting Inspector General Cynthia Schnedar, who is investigating the department’s failed “Fast and Furious” gun walking operation, to deliver her report before the 2012 November elections pass. It has been over nine months since Rep. Green and Rep. Rahall, among other Democrats, sent their letter to the president. I asked Congressman Green if he believed if the IG is taking too long to release the report on the Fast and Furious operation. “Yeah. They ought to deal with this problem, because there is no reason at all that that many weapons should have made it over to Mexico to be exported into Mexico without controls on it and it’s such a black eye on the ATF and the Department of Justice and our government that we allow that to happen,” Rep. Green said. 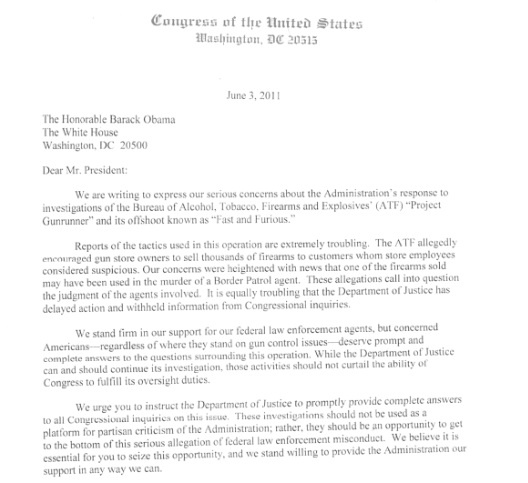 “I know there’s embarrassment at ATF, and I know this program is not just under President Obama. It was going on previous to that, but they ought to deal with it. They ought to clean it up and make sure that doesn’t happen,” Mr. Rahall stressed. Attorney General Eric Holder has yet to release the remaining documents from the 80,0000 files both Senator Chuck Grassley, Iowa Republican and ranking member of the Senate Judiciary, and Rep. Darrell Issa, California Republican and Chairman of the House Oversight and Government Reform Committee, have asked for.